High Five, Moms and Dads! High. Five. So much is said of parents today. They’re helicopters. They’re tigers. They’re elephants. They’re snow plows. There are attachment parents and free-range parents, Pinterest moms and stage moms, millennial moms and hipster dads, crunchy parents and authoritative parents. Then, of course, there are the presumably ongoing “mommy wars.” Who’s winning, anyway? When I take a look around at the parents I actually know or just pass by in life, I don’t see mommies who are at war with one another, but moms and dads who love their kids and do their very best to build as great a life as possible for their families. These parents are people who can’t be summarized by some pithy label but who have different facets of character and entire life experiences that they bring to the table in raising their kids. I’m guessing that every one of them is killing it in their parenting on some days and barely getting by others. These parents are constantly making choices for their families about where they live, and what they eat, and how they spend their time, and what they focus on, and what they don’t. They are deciding what kinds of diapers to buy, or what colleges to apply to, or what to say when their daughter is in tears at the playground, or their son is being tested for a learning disability. They are relying on instinct, support, and all of their innate gifts and talents to do the best that they can. They are giving their all to provide financially, spiritually, emotionally, and physically to the needs of their children. It’s not always easy, but to anyone who is a parent, it’s all familiar. Thinking about different ways of parenting and new ideas is great, but the problem with superficial labels is that they are just that—superficial. What’s more, they come imbued with judgment which is truly the last thing a parent needs. To the different parents out there, no matter your style, your philosophy, or your label, I offer you a High Five! To the mom who rolled up to school drop off in her pajamas yelling “I love you!” to her kids as they step out of the car: High Five! To the dad who just lost his job and is frantically sending resumes and researching interim health care for his family: High Five! To the grandma who is shuffling her grandkids between three after-school activities and feeding them dinner to support two working parents: High Five! 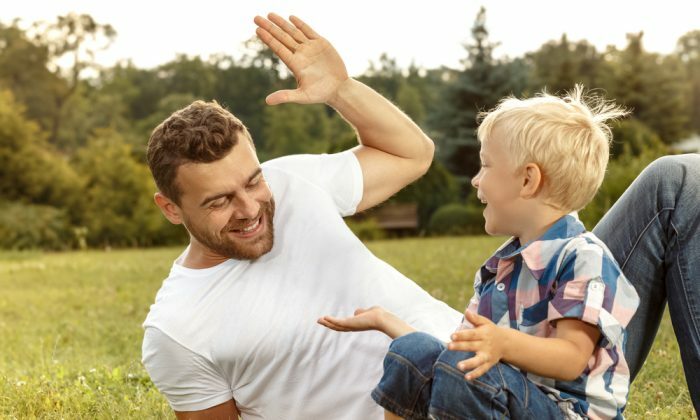 To the dad who makes sure his kids get fresh air each day: High Five! To the mom who managed to make a sandwich with bread ends and Fluff because that’s all she had in the kitchen: High Five! To the parents who sometimes feel frustrated, embarrassed, tired, overwhelmed, or sad: High Five! To the parents who can’t believe how much they love their kids and who are super proud of those little (or perhaps now grown) people: High Five! To the parents who make choices that are different than the choices I make: High Five! To the parents who knew way more about parenting before actually becoming parents: High Five! To the parents who sometimes feel like they are failing and sometimes feel like they’ve figured it all out and who love their kids and want the best for them and who hand out high fives to other parents like they’re going out of style: High. Five.